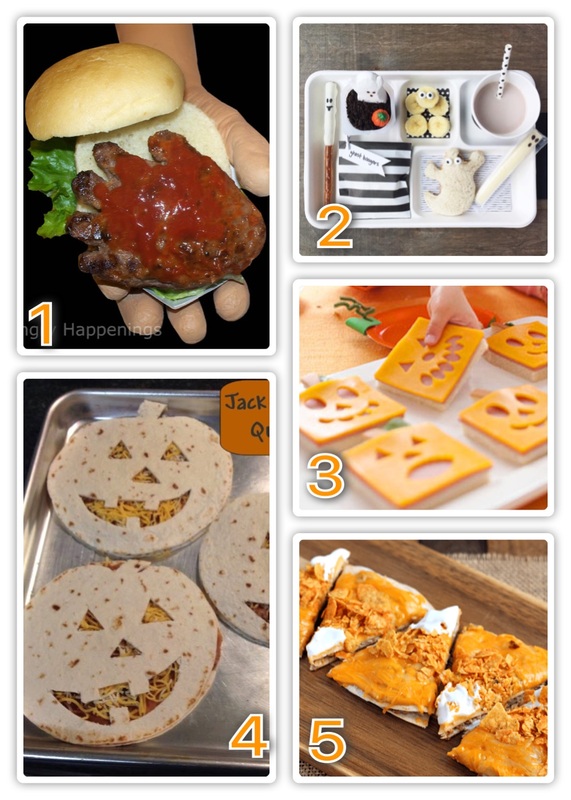 Here are so cute Halloween Meal Ideas that you can do for Halloween. Hand-Burgers Dripping with Blood – Fun way to do hamburgers, just easily shape them into a little hand. Open-Faced Pumpkin Sandwiches – Just by using small cookie cutter to create the cheese fare. How simple! Jack – O – Lantern Quesadillas – Such a different way to do quesadillas! Candy Corn Quesadillas – How cute and simple spin on a quesadilla. Spookily the Square Pumpkin – Great to theme a lunch off of a book, and a cute tradition to start with The Legend of Spookily the Square Pumpkin book. Weiner Worms – I love this spin on hot dogs and who knew they would curl up like that. Spooky Spider PB&J – Turn a regular PB&J sandwich into a spooky treat! Frightful Fall Hop – Another cute and frightful way to do hot dogs! Puking Pumpkins – Fun way to put a spin on spaghetti.